Store key information and descriptions and select and copy as needed. 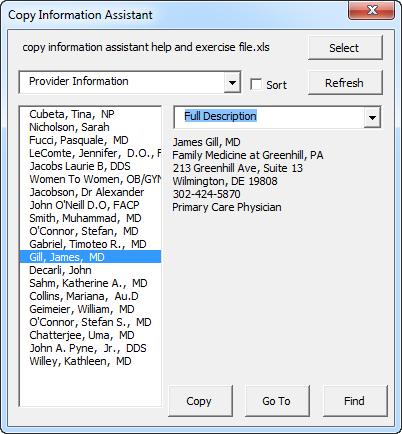 The Copy Information Assistant add-in for Microsoft Excel lets you easy copy information from Excel to any location. No longer do you need to do the search and find. Just select the entry you want and the data column and click copy. The information is copied to the clipboard and you can paste into any form or email immediately. It is compatible with Microsoft Excel 2007 to 2019 and Office 365. One uses the Select button to select the workbook. The first dropdown are a list of all the worksheets which contain information. The second dropdown are the column descriptions. The list box contains all the entries in column A. One just selects the information one wants and clicks the copy button! Then one goes to the form or email and pastes it! The Copy Information Assistant remembers your last used workbook and selections, so the next time you open Excel and click on the Copy Information button on the new Specialty ribbon, it asks if you wish to use this workbook. And, if it is not open, it will open it for you! Any sheet in your workbook that has the word "info" or "information" as part of the sheet name is displayed for selection.